Jere White Reports on Grains Council China Corn Harvest Tour. Jere White, Executive Director of the Kansas Corn Commission, returned from the U.S. Grains Council's China Corn Harvest Tour the first week of October. China is the world's second leading corn producer, after the United States, but it emerged as a net corn importer in 2010 and 2011 as surging domestic demand outstripped domestic production. Despite this year's record production, the Council anticipates that rising demand will continue to create export opportunities for U.S. producers in 2011/2012 and beyond. The U.S. Grains Council today released an estimate of China's 2011 corn production of 167 million metric tons (6.6 billion bushels), up 5.6 percent from last year. China is the world's second leading corn producer, after the United States. 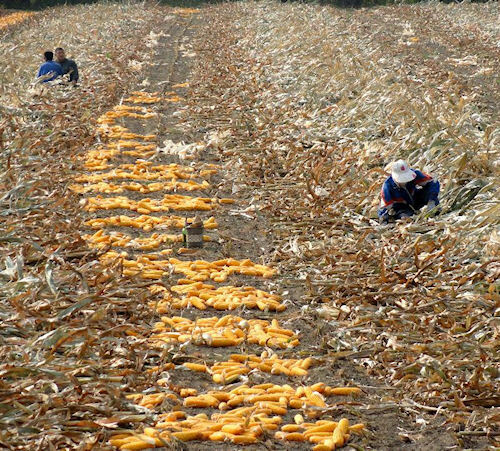 The Council's China Corn Harvest Tour began in 1996, when it provided the only non-governmental crop survey report available for China. Conducted by teams of experts from the private sector, most with long experience in the China grains market, the Council report has gained a reputation for consistency, reliability, and transparency in assessing an often-opaque China supply-and-demand situation. According to White, "While the ability of the Chinese to raise a decent crop was easily documented during the tour, it was also very apparent that there were many challenges to their system, which relies heavily on manual labor. Urban encroachment will continue to remove land from production and an ever expanding population will drive increased demand of all grains, including corn." This year's report is highly anticipated because of the interest surrounding China's recent emergence as a major corn importer. China's rapid economic growth has produced the world's fastest growing middle class, and demand for meat and dairy products is soaring. China's domestic corn prices this summer reached $10 a bushel. At the same time, high U.S. and international prices may have restrained China's corn imports, leading to accelerated drawdowns of already low stocks. China is committed to food security and traditionally has maintained relatively high reserve levels.